The Rolph family seems to have originated in Almondsbury which is not far from Thornbury in South Gloucestershire but its members were prominent in Thornbury in the 18th century as solicitors and surgeons. The parish records indicate that it was generally the custom for Rolph children to be born in Almondsbury but baptised in Thornbury. On this page we have dealt only with the few members of the Rolph family who were associated with the properties we have researched so far. George Rolph (1727 – 1792). George was born in 1727 the son of John Rolph of Almondsbury. George Rolph was an Attorney at Law (solicitor), whose name appears on many legal documents from the Thornbury district. He also became steward of the Manor of Thornbury. George’s first marriage was to Susannah Cox, the daughter of Thomas and Elizabeth Cox of Almondsbury on 16th October 1750. They had seven children: John who was born 11th September 1751, Betty baptised on 27th June 1752, Sarah baptised on 15th January 1755, George born 11th January 1757 and baptised on 4th February 1757, Susannah baptised on 9th October 1759, Amelia baptised on 22nd October 1762 and Esther (or Hester) was born on the 18th May 1764 and baptised on 7th June 1765. We can’t be sure where George and Susannah lived immediately after their marriage. By 1860 they had settled in their house now known as 40 High Street. In 1785 George bought from his son, George junior, the neighbouring house, now known as 38 High Street. George’s first wife Susannah died on the 28th September 1765 aged 41 and was buried in Almondsbury. Of George and Susannah’s children, four of their daughters died unmarried, Betty in 1839, Sarah in 1828, Susannah at some time after 1841, and Amelia in 1822. Their daughter, Esther, married Joseph Hughes in St James Church in Bristol on 25th April 1793. John the eldest son died 13th September in his ninth year. Their only surviving son, George, became an attorney and banker (see below). George Rolph’s second marriage was to Sarah Clarke, and this took place in Thornbury Church on the 31st of May 1767. Sarah Clarke was the daughter of Thomas Clark a tallow chandler and his wife Sarah. This marriage seems to have brought with it a substantial amount of property. By an indenture dated 20th March 1767 George Rolph acquired some tofts and garden land on which the property now known as “The Georgian House” now stands, from Thomas Clark, apparently as part of the marriage settlement. The earliest deeds of 9 Castle Street (now known as The Lion House) refer to indentures dated the 27th and 28th of March 1767, two months before the marriage of George and Sarah. They are a lease and release made between George Rolph and Sarah Clarke of Thornbury, spinster, these too seem to be part of the marriage settlement. George and his second wife Sarah had four children: Thomas born at Almondsbury on the 29th April 1768 and baptised at Thornbury on the 23rd of May, Anne baptised at Thornbury on the 21st of February 1770, John born 14th November 1771 was baptised at Thornbury on the 22nd of March 1772 and Mary baptised at Thornbury on 23rd of October 1774. Their son John died on 22nd March 1772 and was buried at Almondsbury. George owned several major houses in and around Thornbury. From 1772 and perhaps earlier he lived at his house in the High Street, now known as 40 High Street. The Land Tax Records of 1780 show that George Rolph was renting out a property that appears to be the Lion House in Castle Street in Thornbury to a widow named Mrs Rebecca Horton. Mrs Horton was a tenant in the Land Tax Records until at least 1784. We don’t know when she left the “Lion House” but there is a reference to a will on the internet which might have some relevance. The will of Richard Hankins of Lyons Inn, in the County of Middlesex proved 24 Dec 1785 left to Mrs Rebecca Horton of Thornbury in the County of Gloucester widow “my estate in Broad Street, Bristol (parish of St Philip & St James) plus the interest on £1000 Stock in the Centurion Bank Annuities for life“. The Bath Chronicle of 10th April 1800 had an announcement of the death in Thornbury of Mrs Horton the widow of Captain Horton. She was said to be in her 94th year. George Rolph died on 30th August 1792 aged 65. He was living at what later became 40 High Street at the time of his death. His last will and testament dated 30th July 1792 shows he owned a long list of property, mostly in and around Thornbury, but including some in Frampton Cotterell. In Thornbury, he left 38 and 40 High Street to his son, George. He left the three properties at the bottom of the High Street (later known as 7, 9 and 11 High Street to his daughters, Susannah and Hester. He left his son, Thomas, the Georgian House and the adjoining properties, the Lion House and a property at 49 High Street. Sarah died on 21st February 1823. Of George and Sarah’s children, Thomas became a surgeon and married Frances Petty (see below) and Ann married Thomas Wright Lawford of London on 6th February 1806. 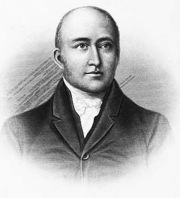 George Rolph junior (1757 – 1815). George was born in 1757 the son of George Rolph and his first wife Susannah. He became an attorney like his father. In 1774 George Junior bought the house now known as 38 High Street from Solomon Smith. At first it would seem that he let it out as the 1780 Land Tax record shows that George was renting it out to Thomas Lewis and in 1781 it was Elizabeth Prim who was the tenant. By 1782 however George Rolph junior must have moved into the house as he is shown as the owner and occupier of the property in the Land Tax records. On 16th and 17th December 1785 George Rolph Junior sold it to his father who was living next door at 40 High Street, a property he already owned. and also all that messuage or dwelling house wherein John Barnett and Betty Wise lately dwelt and wherein the said Betty Wise and George Scarlett do now dwell with the appurtenances which I lately purchased of Thomas Neale and his wife situated in the said borough of Thornbury in the said street called the Chipping or Silver Street lying between the last mentioned messuage and the messuage and premises in which I now dwell‘. George and Sarah had seven children; three of these were called George (so presumably the first two died) and there were also two daughters called Susannah. The ones who survived were: William born 20th August 1791, Annis born 29th July 1794, Susannah born 6th August 1799 and George born 8th October 1800. We assume that George Jnr moved to live in his new mansion house (which later became known as 35 High Street). He appeared to let 40 High Street out to tenants. At some time around 1800 George acquired a ruinous property at 37 High Street and he had a new building erected there and it became the home of George’s step-mother, Sarah Rolph. George (Junior) also established a private bank in Thornbury in 1808, which went by the name of Rolph & Co. The bank was located in a property owned by George’s sister, Susannah and the property later became known as 11 High Street. This bank was to evolve quickly, and took many names. In 1825 it was printing its own currency as Parslow, Rolph & Co, went on to become Harwood & Co Bank, the Thornbury Bank and later became the Thornbury Old Bank, situated on The Plain. Sarah died aged 46 and was buried at Almondsbury Churchyard on 11th December 1813. George died aged 58 and was buried at Almondsbury on 30th October 1815. In his last will and testament written on 20th May 1815 he left everything to two of his children, William and Annis (although Annis renounced any claim shortly after his death). The will notes that George’s three unmarried sisters, Betty, Sarah and Amelia, were living in 40 High Street. He directed that all his property should be sold, but specified that Amelia should be given the opportunity to buy 40 High Street and the adjoining property for £550, which she did. Of George Rolph junior’s children: William took over the mansion house at 35 High Street until his death in 1858, George took over 40 High Street until he died in 1841, Annis married Adrian Stokes in 1816 and moved to live at what became Stokefield House and Susannah died unmarried on 28th May 1866. Thomas Rolph (1768 – 1814). Thomas was born in 1768 the son of George Rolph the elder and Sarah Clarke. In 1789 George Rolph the elder had settled 9 Castle Street in Thornbury (known as the “Lion House”) on Thomas Rolph his eldest son by his second marriage. Thomas at that time was living in Mill Lane, St Olave, Southwark and was described as a surgeon married to Frances Petty, the only daughter and sole next of kin of Ann Petty of Rotherhithe who had died a widow. George Rolph’s settlement of the “Lion House” on Thomas was stated to be in consideration of his marriage, as well as for other considerations. It was conveyed to him for life and after his death was to go to Frances, Thomas’s wife, if she should outlive him, and then to their children. The Rolph family perhaps moved back to Thornbury for the birth of their children. The will of Ralph Grove dated 1790 shows that Thomas Rolph the surgeon was then living in one of Ralph’s properties in the High Street and this is confirmed in a later indenture. The property in which he was living was the building which became known as 57 High Street. The land tax records show that Thomas had become the owner of 47 High Street by 1796 and that he was occupying the property himself. He was still there in the 1797 record, but after that he let it out to tenants. Thomas and Francis were living at Grovesend at some point, certainly by 1807 according to an indenture of that time. Thomas and Frances had a very large family who were all born in England and ten of them emigrated to Canada with their parents. We know something of how Thomas and Frances Rolph educated their large brood. We have seen the receipts for the payment of Mr Virgo for the tuition of Emma and Sarah Rolph dated 1809. The Trade Directories show that Thomas Virgo was a schoolmaster as early as 1791. A receipt dated 1810 mentioned four daughters and is for their board, washing, shoes and other necessaries. The daughters mentioned in this document are Emma, Sarah Anne, Mary and Louisa. Instruction was still being given by Mr Virgo to Emma, Sarah and Amelia. We have seen receipts to John Croome dated 1809 for the education of three of their sons, John, George and Romaine. The following year receipts show that they were receiving instruction in Latin from the the Rev. William Llewellin. Mr Croome continued to teach them writing and arithmetic. Thomas Rolph, George’s son also owned property in St John Street and St Mary Street, including the malt house which now stands empty opposite the Plough pub, but which used to be occupied by Green and Burton’s business. In 1809 Thomas and Frances directed that the “Lion House” and other properties should, immediately after their deaths, be conveyed to John Rolph their eldest son. This action was probably prompted by their decision to emigrate to Canada. In 1809 on 22nd November Thomas took out insurance for furniture which was shipped to Quebec from Bristol. Various other items followed, including his curricle which was shipped over in 1811. In May of 1811, by which time they were presumably settled in in the New World, Frances and Thomas paid £260 for the passage of their ten children and three servants to New York. They also paid £7 19s 6d for the children and their luggage to be taken to Bristol for the voyage. By 1814 Thomas and Frances were living in Charlotteville in the London district of the province of Upper Canada, where Thomas died intestate on the 14th of March that year. Because Frances survived her husband and as such had an interest in the property, legal documents had to be procured from her in order to effect the sale in 1818. She appointed Edward Salmon, surgeon, of Thornbury and Thomas Morris, gentleman, of Thornbury (a solicitor) as trustees to act for her in disposing of her properties in Thornbury. In 1819 an oath of witnesses to her deeds and the certificate of a Notary Public were despatched from Canada. The witnesses included George C. Salmon of Woodhouse in the London District of Upper Canada and his wife Mary who were related to Edward Salmon of Thornbury. (The Salmon family had become wealthy through their involvement in the slave trade in Jamaica). John Rolph (1793-1870), who was born on 4th March 1793 and baptised in Thornbury on 5th April 1793. He was a student at Inner Temple London from November 1809. A photograph of his portrait is below on the right right. He joined his family in Canada in 1812. He returned to England to study law and medicine at St John’s College Cambridge and then trained at Guy’s and St Thomas’s hospitals. In 1821, having been called to the bar, he moved back to Canada where he had a very distinguished political and medical career. 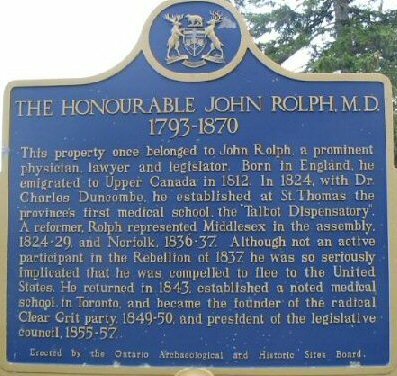 He established a medical school in Toronto and represented Middlesex and then Norfolk in the National Assembly. The plaque below on the left was erected to him by the Ontario Archaeological and Historic Sites Board in the township of Southwold in Elgin County. Mary Anne who was baptised 20th August 1790. In March 1815 she married Archibald Taylor of Charlotteville, Canada. Frances, their first daughter, who was baptised in Thornbury on 2nd May 1792 married Christopher Hamilton, a Lieut. Colonel in the army on 18th October 1813 in Canada. She died in 1814. George was born on 7th April 1794 and baptised in Thornbury 21st May 1794. He became very famous in Canada where he was a lieutenant in the War of 1812. He settled in Dundas and became Clerk of the Peace in the Gore District. The house he built in Cross Street there is now the oldest house in the town. George Rolph was much criticised for being aloof from the townsfolk and he was alleged to have had a relationship with his housekeeper, Mrs Evans which caused much scandal in the town. On the evening of July 2nd 1826 a group of men assaulted him and tarred and feathered him. Rolph prosecuted them himself in court and as the alleged attackers were leading Tories the case caused much attention. Rolph Street in the city of Hamilton is named after him. In 1836 George was back in the UK when he married Georgina Clement in Kidwelly in Wales. They moved to Wentworth in Canada where they had three children before Georgina died. George Rolph died in 1875. Romaine was born in Thornbury on 4th May 1795. According to the Dictionary of Canadian Biography, Romaine studied divinity under John Strachan and became Rector of Amhurst and of Queenston County Lincoln in Canada. He married Margaret Stanton in April 1823. Romaine died 22nd January 1868. Thomas was born in Almondsbury on 16th September 1800. He later became vicar in Chisledon in Wiltshire. Thomas Rolph, appears on the website of “The Original Catholic Encyclopaedia” with an account of his activities in Portsmouth, Canada, West Indies and USA. Elizabeth was baptised 3rd August 1796 and died unmarried in March 1835. Emma was baptised Thornbury 16th August 1797. She married William Salmon, the County Judge of County Norfolk on 14th December 1833 and died 8th February 1838. Amelia was born 15th June 1798 and died May 1799. Amelia, the second daughter of that name, was born 10th April 1800 and died 24th August 1849 unmarried. Sarah born 7th May 1799 and died 10th July 1829. Sarah married the Rev George Ryerson, a Catholic Apostolic Minister of Charlotteville. We understand from the Dictionary of Canadian Biography that Sarah and George had a son and daughter. George married twice more and had other children. Louisa born 12th July 1805. Maria born 22nd August 1806 and married James Durand.